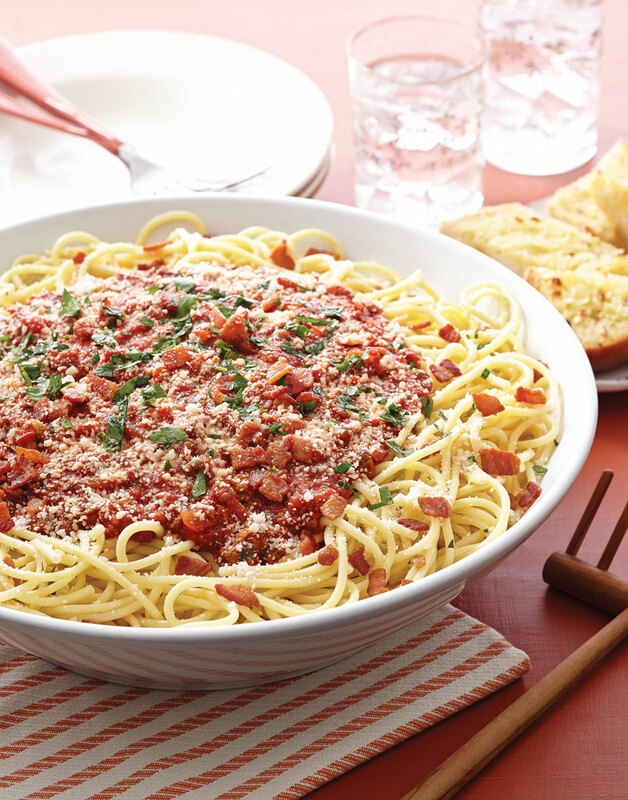 Traditionally made with guanciale (cured pork cheek), this version of the classic Roman tomato sauce gets its big meaty flavor from both bacon and ground sirloin. Cook bacon in a Dutch oven or large pot until crisp; transfer to a paper-towel-lined plate. Drain all but 2 Tbsp. drippings. Add ground sirloin and cook over medium-high heat until browned, crushing with a potato masher into small pieces, 3–4 minutes. Stir in onions, garlic, and tomato paste; cook until onions soften, 3 minutes. Deglaze Dutch oven with vinegar and reduce until nearly evaporated. Add whole and crushed tomatoes and season with salt and pepper flakes. Reduce heat to medium and simmer sauce 30 minutes. Cook bucatini in a pot of boiling salted water according to package directions; drain. Off heat, stir in Romano, parsley, and bacon; serve over bucatini. For an evenly textured sauce, use a potato masher to crush the sirloin into small pieces as it cooks. Deglaze the Dutch oven with a bit of balsamic vinegar, then reduce it to concentrate its flavor. Use San Marzano tomatoes if you can. They're stronger, sweeter, and less acidic than other tomatoes.